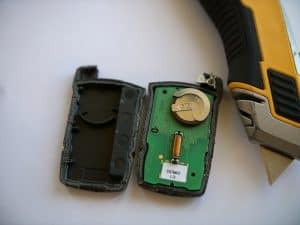 Learn how to change the battery on your car key fob! Welcome to FobBattery.com! We provide dozens of original videos, photos, and content on how to change car fob batteries! It’s not the most exciting of topics I know, but it’s been a labor of love to put together these guides. There are hundreds of different types of key fobs in existence, and we are working our way through all the major car brands to give you in-depth tutorials for all of them. Most key batteries are “CR” coin or key batteries – such as the CR 2450 key fob battery. Below is our current list of brands we have built out a database of batteries and fobs for, along with tutorials on how to fix or replace / change them on some of the most popular cars in the world. We also have a guide to changing the battery in the Tile Mate and Tile Pro devices. The most popular car key fob battery is the CR2032. This is the most popular car key fob battery in the world. The numbers in the battery indicate the size of the battery in diameter (wide) and height (tall). So the 2032 battery is 20mm wide and 3.2mm tall. The C indicates a lithium chemistry battery. The R indicates the shape: Round. Check out a few of our how-to guides on our Pinterest page.